You will be picked up at your hotel in Cuzco, for a spectacular early morning drive through the Sacred Valley of the Incas, which takes you to the trailhead at Km. 82 of the Machu Picchu railroad. After getting acquainted with the trail crew we set out, crossing a footbridge to hike a gentle two hours down the Urubamba canyon, and then visit imposing sculpted Inca farming terraces and the settlement of Llaqtapata on the banks of the Cusichaca side river. You then climb a short way up the Cusichaca valley to Huayllabamba, the last inhabited village on the trail, where you will camp. Lunch and Dinner in camp. You will pick up an Inca stairway and ascend again past the small Inca site of Runkuracay. 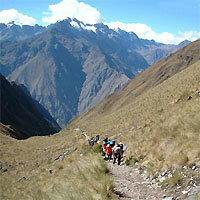 As you reach the second pass, the landscape opens onto spectacular new views to the snowpeaks of the Pumasillo range. You will descend to the ruins of Sayacmarca (Inaccessible Town), an intricate labyrinth of houses, plazas and water channels, perched precariously on a rocky spur overlooking the Aobamba valley. The Inca trail, now a massive buttressed structure of granite paving stones, continues along the steep upper fringes of the cloud forest through a colorful riot of orchids, bromeliads, mosses and ferns. At the third pass pinnacles topped with Inca viewing platforms overlook the archaeological complex of Phuyupatamarca (Cloud level Town). Pausing to explore the wondrous maze of Inca stone towers, fountains and stairways that spillins down the mountainside here, you begin a long descent through ever-changing layers of cloud forest. An Inca stairway partly cut from living granite leads you finally to the camp by the ruins of WiNay Wayna (Forever Young), the largest and most exquisite of the Inca Trail sites. Breakfast, Lunch and Dinner in camp. An early morning hike takes you across a steep mountainside through lush, humid cloud forest of giant ferns and broad-leaf vegetation. Suddenly you cross the stone threshold of Intipunku (Sun Gate) and encounter an unforgettable sweep of natural beauty and human artistry - a backdrop of twisting gorge and forested peaks framing the magical city of Machu Picchu. Briefing lecture before the tour. A licensed, well-trained, English-speaking guide. Camping Equipment: spacious North Face tents, and mattress. The North Face V-25 tent is a three-person expedition tent use for just two passengers to offer clients more space and comfort. Dining tent, tables and chairs, and cooking equipment; Chef and Assistant Chef preparing healthy, hearty meals. Lunch at Machu Picchu Sanctuary Lodge (last day). Well-paid and well-treated porters and staff. Private transportation from Cusco to the start of the trail. First Class train - the Vistadome. Bus transportation to/from Machu Picchu. Permit fees to the Inca trail. Entrance tickets to the archaeological sites. 24-hour telephone assistance in Lima and Cusco. Not included: meals in the cities, alcoholic beverages, extras, tips, laundry service, additional tours, insurance, sleeping bags, hiking boots, and other personal gear. Although the trek is rated as moderate, we strongly suggest spending at least two nights before the start of the trek to totally adjust to the altitude. Do some exercise before you go. Altitude at the Inca Trail: Minimum 2430m/Maximum 4200m. Keep hydrated. Drink Plenty of water that also helps to acclimatize to the altitude. The paving on the trail is irregular. Please be careful with your steps. The maximum kilogram per person: 20 pounds/10 kilograms which you have to store in the provided duffle bag. The Andean weather can be unpredictable, despite the sharp divide between dry and wet seasons. The dry season runs from May to October or November (the best time for this amazing trek); the rainy season goes from December through April. Nevertheless, in the forested fringes of the Amazon basin where Machu Picchu lies, showers are not uncommon at any time of year. Therefore rain pants and jacket are essential gear that should always be in your daypack. On boarding, an ID (identification) and the train ticket will be required. A photocopy of the passport or other ID is accepted. If the passengers will overnight in the Machu Picchu area, they must take the original passport or ID, along with the Andean Immigration Card, so that the hotel may exonerate the sales tax of the overnight. The Andean Immigration Card is handed by the plane crew upon arrival in Peru.Only carry on or backpacks will be allowed with the following characteristics: Not more than 5 kilos or 11 pounds,not more than 62 inches (157 centimeters) (height+length+width). Backpacks or Carry On will go with the passenger, and by no means should block the access gates or the corridors. Packages 100% Flexible. Book Today! Paypal worry free payment. Enquire! First Class Train to Inca site.